Objectives: To determine the attitude of general practitioners towards evidence based medicine and their related educational needs. Design: A questionnaire study of general practitioners. Setting: General practice in the former Wessex region, England. Subjects: Randomly selected sample of 25% of all general practitioners (452), of whom 302 replied. Main outcome measures: Respondents' attitude towards evidence based medicine, ability to access and interpret evidence, perceived barriers to practising evidence based medicine, and best method of moving from opinion based to evidence based medicine. Results: Respondents mainly welcomed evidence based medicine and agreed that its practice improves patient care. They had a low level of awareness of extracting journals, review publications, and databases (only 40% knew of the Cochrane Database of Systematic Reviews), and, even if aware, many did not use them. In their surgeries 20% had access to bibliographic databases and 17% to the world wide web. Most had some understanding of the technical terms used. The major perceived barrier to practising evidence based medicine was lack of personal time. Respondents thought the most appropriate way to move towards evidence based general practice was by using evidence based guidelines or proposals developed by colleagues. Conclusion: Promoting and improving access to summaries of evidence, rather than teaching all general practitioners literature searching and critical appraisal, would be the more appropriate method of encouraging evidence based general practice. General practitioners who are skilled in accessing and interpreting evidence should be encouraged to develop local evidence based guidelines and advice. Evidence based medicine is being promoted in general practice as throughout the NHS. General practitioners can attend workshops on how to practice and teach it, research networks promote its use, the Cochrane Library has an increasing number of systematic reviews relevant to general practice, and the journal Evidence-Based Medicine regularly contains summaries of general practice topics. Books on evidence based medicine present common general practice questions, show how to critically appraise papers, and to evaluate different sorts of evidence. Critical appraisal is now part of the MRCGP exam. Recent papers have highlighted the need for evidence based general practice,1 2 the role of evidence based guidelines in the management of conditions common to general practice,3 4 5 and the estimated proportion of interventions in general practice that are based on evidence.6 One paper has described the problems that may arise in general practice from overreliance on evidence based medicine.7 These included the potential lack of applicability of the biomedical perspective and the role of opinion in tailoring evidence to a patient' context and preferences. In the United Kingdom, however, very little is known about general practitioners' attitudes towards evidence based medicine, the extent of their skills to access and interpret evidence, the barriers to moving from opinion based to evidence based practice, and the additional support necessary to incorporate evidence based medicine into everyday general practice. The objectives of this study were to determine the attitude of general practitioners towards evidence based medicine and their related educational needs. Postgraduate tutors, health authorities, and the Wessex Primary Care Research Network (WReN) required this information to inform local strategies aimed at encouraging general practitioners to implement evidence based medicine. Early approaches used in Wessex included workshops on critical appraisal and evidence based medicine and training in performing literature search as part of courses on research methods. After initial local enthusiasm, however, it had become harder to recruit general practitioners to such training events. Views on how best to move from opinion based to evidence based medicine. In April 1997 we sent a questionnaire to 452 general practitioner principals in the former Wessex region in south England. These represented 25% of all Wessex general practitioner principals obtained from a national database,8 who were randomly selected by means of random numbers generated by Microsoft Excel with supervision from a statistician. A free text section to determine their views on the major barriers to practising evidence based medicine in general practice. These brief statements were coded and grouped by AMcC. (For details of the questionnaire, see copy included in this article on the BMJ website www.bmj.com). We entered the data into a spreadsheet. We initially identified 38 categories, but these were grouped into broader categories during the analysis. We analysed data from the visual analogue scales using spss for Windows 6.1.2 and analysed the other data using Microsoft Excel 5.0. We compared differences between respondents and non-respondents using the χ2 test. Of the 452 questionnaires we sent out, two were returned because the general practitioners had retired. We received 302 replies (67%) to the remaining 450 questionnaires. Table 1 compares the characteristics of the respondents and non-respondents. Attitudes towards evidence based medicine—The figure shows the responding general practitioners' attitudes towards evidence based medicine. 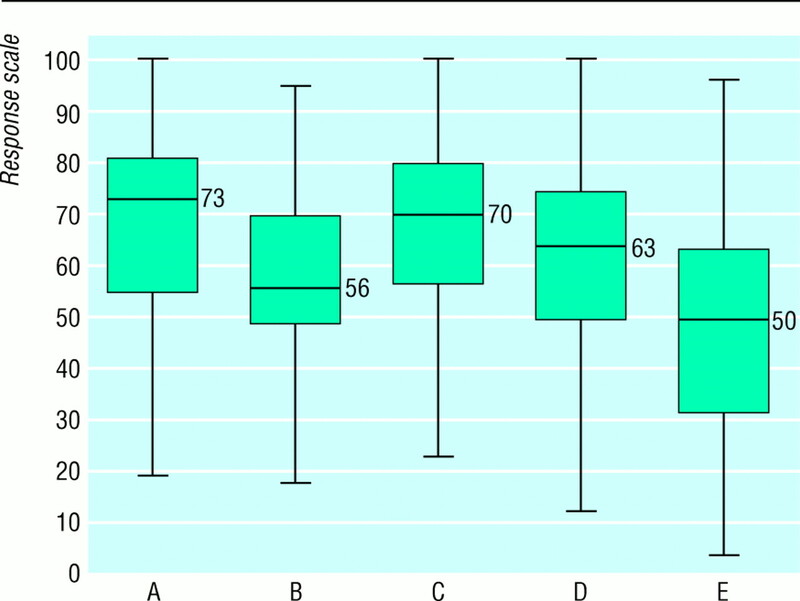 Most were welcoming towards the current promotion of evidence based medicine (A), although colleagues were perceived to be less welcoming (B), and most agreed that practising evidence based medicine improved patient care (C) and that research findings were useful in the day to day management of patients (D). The median value for the estimated percentage of the respondents' clinical practice that was evidence based was 50% (E). Awareness and perceived usefulness of relevant information sources—Table 2 shows that the doctors had a low level of awareness of extracting journals, review publications, and databases relevant to evidence based medicine. Only 40% of respondents were aware of the Cochrane Database of Systematic Reviews, 52% of Bandolier, and 60% of Effective Health Care Bulletins. Access to relevant databases and the world wide web—Only 20% (41/220) of respondents had access to Medline or other bibliographic databases at their surgery while 76% (173/227) had access at their local library and 21% (45/219) at their home. They also lacked access to the world wide web: only 17% (40/236) had access at their surgery, 41% (73/178) at their local library, and 29% (71/247) at their home. In the previous year 51% (102/201) had used Medline or another database for literature searching or had asked someone to do a search on their behalf, and 12 had searched on more than 10 occasions. Of these 102 doctors, 28 reported having had some training in literature searching, while a total of 16% (47/297) had received formal training in search strategies. At least 11 of those trained had not made a literature search in the previous year. Those trained in searching were more likely to have access to Medline or another database in their home (30% (14/47) v 11% (27/250)) and in their surgery (32% (15/47) v 12% (29/250)). Understanding of technical terms used in evidence based medicine—Most of the respondents had some understanding of the technical terms used in evidence based medicine, and a third felt able to explain to others the meaning of some of these terms (table 3). However, only 15% (44/290) understood publication bias and could explain it to others. A considerable proportion who did not understand the terms expressed a desire to understand (9-48%). In total 39% (115/297) had received formal training in critical appraisal. Views on major barriers to practising evidence based medicine—The main perceived barrier to practising evidence based medicine in general practice was a lack of personal time (table 4). Views on how best to move from opinion based to evidence based medicine—Most of the respondents (57%) thought that the most appropriate way to move from opinion based practice to evidence based medicine was “using evidence based guidelines or protocols developed by colleagues for use by others,” while 37% thought it should be by “seeking and applying evidence based summaries” and only 5% by “identifying and appraising the primary literature or systematic reviews” (table 5). A response rate of 67% is a considerable achievement as response rates to questionnaire surveys among general practitioners are dropping.11 Respondents were more likely to be members of the Royal College of General Practitioners and the Wessex Primary Care Research Network. Other questionnaire studies have suggested that members of the royal college are more innovative12 and more “enthusiastic” to participate in quality assessment13 than non-members. The difference between the respondents' attitude and their perception of their colleagues' attitudes could be explained by a more positive attitude of respondents towards evidence based medicine than non-respondents. Our subjects were general practitioners rather than primary healthcare teams. Our narrow focus was partly due to the availability of an adequate sampling frame, but we are sending a similar questionnaire to practice nurses to widen our understanding of evidence based health care in primary care. Understanding of technical terms—Our respondents showed a partial understanding of the technical terms used in evidence based medicine. Interpretation of evidence is a key element in practising evidence based medicine, and this partial understanding could hinder interpretation and make cascading of evidence to other members of the primary care team more difficult. A considerable proportion of respondents perceived personal and organisational inertia and the attitudes of colleagues as a major barrier. Tensions between doctors in general practices may lead to difficulties in investing in technology to access evidence and in failures to agree practice policies on clinical management that are evidence based. However, the attitudes of patients were also seen as a barrier. Views on how best to move to evidence based medicine—The focus of workshops on critical appraisal and evidence based medicine in Wessex has been on training healthcare workers to identify and appraise primary literature or systematic reviews. However, few respondents thought that this was the most appropriate way to move from opinion based to evidence based medicine. Most thought that the best way was by using evidence based guidelines or protocols developed by colleagues for use by others. Only 14% of those currently identifying and appraising primary literature or systematic reviews thought this was the best method. Postgraduate tutors, health authorities, and primary care research networks are attempting to encourage general practitioners to implement evidence based general practice. They should refocus their efforts on promoting and improving access to summaries of evidence. They should also encourage local general practitioners working in localities or commissioning groups, who are themselves skilled in accessing and interpreting evidence, to develop local evidence based guidelines and advice. This may be a more effective approach to harness the interest and welcoming attitude of general practitioners towards evidence based medicine than trying to teach all general practitioners skills in search and critical appraisal. We thank the Wessex general practitioners who took part in this survey. Funding: The Wessex Primary Care Research Network is funded by the South and West Research and Development Directorate. The Southampton GP Tutor Educational Fund paid for the coding and entry of data. Contributors: HS developed the original idea and questionnaire. AMcC, HS, PW, and JF refined the questionnaire and jointly wrote the paper. Chris Spencer-Jones, Paul Roderick, and Ruairidh Milne gave advice on the questionnaire. AMcC coordinated the distribution and follow up of the questionnaire, coded the free text sections, and performed the data analysis. Wendy Davis coded the rest of the questionnaire and provided administrative support. Mark Mullee advised on the random sampling. AMcC is guarantor for the paper.
. Evidence-based learning for general practice. Br J Gen Pract 1996;46:503–4.
. On the need for evidence-based general and family practice. Evidence-Based Med 1996;1:68–9.
. North of England evidence based guidelines development project: summary version of evidence based guideline for the primary care management of stable angina. BMJ 1996;312:827–32.
. North of England evidence based guidelines development project: summary version of evidence based guideline for the primary care management of asthma in adults. BMJ 1996;312:762–6.
. North of England evidence based guidelines development project: methods of guideline development. BMJ 1996;312:760–2.
. Evidence based general practice: a retrospective study of interventions in one training practice. BMJ 1996;312:819–21.
. Evidence based medicine and general practice. Br J Gen Pract 1997;47:449–52.
. Organisations codes file. Leeds: NHS Executive, 1997.
. Evidence based medicine: What it is and what it isn't. It's about integrating individual clinical expertise and the best external evidence. BMJ 1996;312:71–2. The Medical Directory, 1997. London: Financial Times Healthcare, 1997.
. General practice surveys: a questionnaire too far? BMJ 1996;313:732–3.
. Quality of care in general practice—lessons from the past. J R Coll Gen Pract 1989;39:88–90.
. Information systems for general practitioners for quality assessment: I. Responses of the doctors. BMJ 1985;291:1473–6.
. Evidence based general practice: findings of study should prompt debate. BMJ 1996;313:114–5.
. Evidence based general practice: studies using sophisticated methods are needed. BMJ 1996;313:114.
. “Is my practice evidence-based?” BMJ 1996;313:957–8.
. The integration of evidence based medicine and personal care in family practice. Ir J Med Sci 1996;165:289–91.
. Who uses the Cochrane pregnancy and childbirth database? BMJ 1995;310:1140–1.
. Are clinicians interested in up to date reviews of effective care? BMJ 1993;307:1464.
. …so little time, and…. Evidence-Based Med 1997;2:39.
. Evidence-based health care—a resource pack. London: Kings College School of Medicine and Dentistry, 1997.